From time to time I come to think that the French aren’t a very intelligent people. I am not one to stereotype, but here it is just too easy. Take today – after spending the afternoon battling for my sanity with vacant-headed pupils who don’t (or refuse to) understand the simplest of instructions, even in French, I come to my ride home. The bus journey is always bad enough, with kids jostling and bashing past each other without the first bit of consideration that there might actually be other people in their way. But they’re kids so, much as it gets tiresome putting up with them day in, day out, I’ll let them off the hook. No, when it really gets my goat is when I make it to the tram and the adults – if you can call them that – are at the same game. What is it with French people and standing around the doors on trams? Do they have some sort of fetish that no-one has told me about? There are few things that can be more infuriating – or just plain laughable, depending on the mood I’m in – than the stupidity that leaves twenty or thirty people pressed up against each other and the glass of the tram doors while, just a few feet down, there’s plenty of free space – and even empty seats – that nobody has had the foresight to move down and occupy. Of course this happens in other countries too, but I have never seen it to such extremes as here in France. In spite of the numerous calls from drivers, conductors and signs on tramway platforms pleading ‘don’t stand by the doors, move down the gangways’, they seem to have a serious fear of doing just that. It’s the same deal trying to get off a tram – the process of natural selection appears to have at some point left the French without the brain cell that enables the rest of to realise that the quickest way to get on a tram isn’t actually to block the doors en masse, stopping anyone from getting off and therefore by default delaying everyone getting on. No, instead they genuinely seem to think that positioning themselves right around the doors is going to get them on and away more quickly. They’ll stand there, metaphorically scratching their heads wondering why it’s taking everyone so long to get off, and then as soon as there’s space, they’ll push and shove each other to get on as fast as they can. 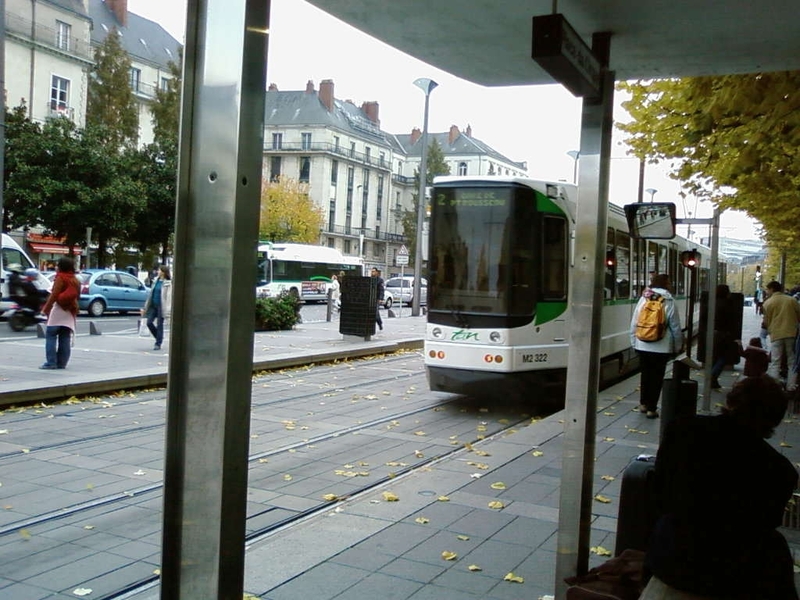 The notion of queueing being a very British habit must also ring true, because there’s no expecting the French to respect the fact that someone else has been at the tram stop ten minutes longer than they have – they’ll still barge their way to the front as if there’s no-one else there. In fact, for a country so obsessed with politeness (think, addressing everyone as ‘sir’ and ‘madam’, saying ‘pardon’ at every given opportunity, greeting a shop’s entire customer base when you come through the door, and shaking hands with or kissing every member of a large group of friends whenever you see them, however casually) – for a country so obsessed with this sort of thing, the French can also be downright arrogant. Yes, that’s another stereotype that at times seem right on the money. This is a country supposedly founded on the principle of fraternity, and therefore presumably also solidarity, and yet it seems pretty dog-eat-dog most of the time. I am equally the sort of person who gets irritated by others randomly stopping in the street. If I am in the street, then generally it’s because I want to get somewhere, not because I want to stand around and pass the time of day – if that’s what I’m going for, then I’ll usually find somewhere more attractive than a grotty pavement to do it. I am also the kind of person who doesn’t tend to dawdle along; instead I want to get where I’m going, not waste time. There’s nothing wrong, of course, with taking your time – but don’t take up the entire pavement between your group of friends, only to move at a snail’s pace and stop the rest of us from getting anywhere. Now, I know France isn’t the only place this happens; far from it – but seriously, the number of people who just wander aimlessly around, stop at a moment’s notice (giving the rest of us little choice but to fall over them) and proceed to stand around, get in the way, gaze at the sky, check their phones (texting/talking AND walking can be done at the same time – it’s possible, trust me! ), have a chat, turn around and go back in the other direction, wander over in a diagonal line to a shop window, have a quick glance and then go back in the opposite direction in another diagonal, but nice and slowly so no-one can move around you….well, you get the picture. Of course, I am neglecting to mention the many fantastic things about France. But sometimes the frustration induced by their don’t-really-give-a-damn attitude just gets too much, and it’s on those occasions that I am glad I have this blog to vent to. I guess that’s part of the beauty of living somewhere relatively long-term; getting to see that all those stereotypes you spent so long rubbishing are actually spot on. Anyway, back to more uplifting themes next time!